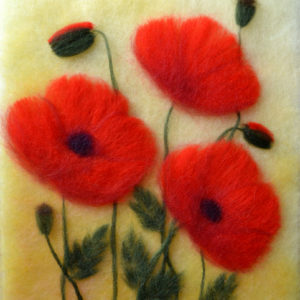 This one-of-a-kind specialty tote bag features one of my original wool paintings “Bouquet of poppies”. The printed reproduction is of such high quality that you can see the individual wool fibers making up the original artwork. The design is printed on both sides of the bag and you can customize yours by selecting black or red handles.